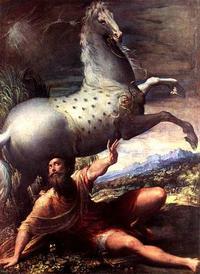 There's no way that I could let a feast as meaningful as the Conversion of St. Paul escape without saying just a little. It has to do with what a great importance that Paul has had in my life over the years. It is easy to reflect back 30 years or better to the times when I first started reading Paul's writings. Interestingly, as I first read the New Testament letters of St. Paul as a teenager, I recall that the pages of my bible had the peculiar odor of bread. Indeed St. Paul's teaching has guided and fed the Church since the beginning--he abandoned himself in God and thus allowed himself to be the instrument of the Holy Spirit who spoke through him. To countless generations the words of the Apostle have been bread for the journey. It's only natural for a convert to have a special relationship with another convert, but this doesn't have to leave anyone out. We should all be converts--without conversion from sin, that is, conversion of the heart toward goodness, how can we come to know God? St. Paul is the best example we have of a person who would have said that there was no way he needed to convert from or to anything. He had his religion and he went about it authentically, though he was blinded by what he thought he knew to be the will of God. However, God has a way of butting in when it comes to an error as serious as the one that Paul was making. Today's feast gives us food for thought. What is it that God wants different in your life? Is there something that needs to be taken away or something to be added? If the answer is no, that's a sign of inner trouble. Perhaps rather than thinking in terms of what there is to convert or turn away from, think what there is to become. My prayer is that we become instruments of God's light in a world that tends to grow increasingly dim. True conversion should always have the objective of becoming something greater than what we are now, though such becoming often involves letting go of what we stubbornly hold on to as the only truth--it's the "but that's not where I am now" argument. I doubt that the comfort of where I am now will see a lot of conversion. Well said. Indeed, there is food for thought, here.